It was a lovely spring day in Munich, but alas stricken with the flu we didn’t have much energy for exploring. Luckily for us we were staying in central Munich only about 10 minutes or so (at ambling pace!) from the famous Englischer Garten. We decided a couple of hours sitting in the sun would do us good so set off to discover more. Our walk took us north of the Marienplatz and we skirted round the imperial “Residenz” of the Wittelsbach dynasty (of which more to come in later posts), past the Hofgarten (garden of the imperial palace) and into the southern part of the Englischer Garten. You could be forgiven for thinking you were in the middle of the countryside rather than a large city. Between the Hofgarten and the start of the Englischer Garten we found yet another area of parkland, this time the Finanzgarten. I’m not sure of the exact translation of the German on the sign, but clearly green recreational space is a priority for the Bavarians and Munich is no exception. Elector Carl Theodor ordered the construction of a new park near the Hofgarten back in 1789. The work was completed and the gardens opened to the public in 1792. Not surprisingly it has been a hugely popular recreational facility for the citizens of Munich ever since! 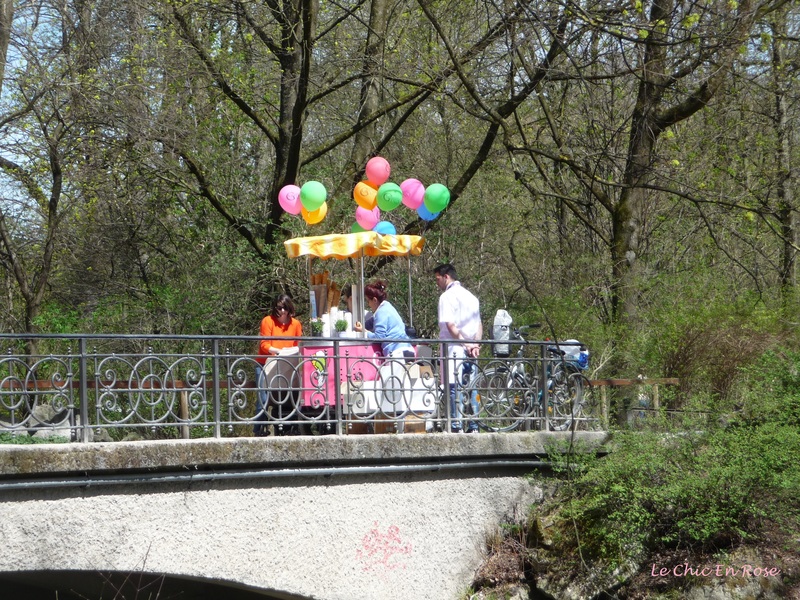 The Englischer Garten is divided into a southern part (2 kms long) and a northern part (3 kms long) separated by a busy road. The gardens are set alongside the River Isar, which meanders its way through the park. There are endless pathways so it’s an ideal place for walking, jogging or cycling. It’s also a very popular spot for sunbathing (not always with clothes on – you have been warned!). We still thought it was on the chilly side though, lovely out in the full sun but there was still a crisp April wind. The park is home to several restaurants and kiosks plus a couple of beer gardens. The larger of the 2 beer gardens, is situated next to the Chiniescher Turm (Chinese Tower). It is the second largest in Munich and you can find out further details here. If you want to eat at the restaurant, bookings are a good idea and if you can negotiate the online booking form in German follow the link here. Had we been feeling more ourselves we would have definitely visited the beer garden and restaurant, but we opted instead to buy gelati from a mobile stall and settled down to enjoy the delicious flavours (very soothing for sore throats too!) overlooking the river. Our vantage point was actually overlooking a man-made off shoot of the Isar, the Eisbach, which has become a very popular spot with surfers (a surfing wave has been created there). There were warning signs about the dangers of swimming and engaging in water sports but no one seemed to take any notice so we were not quite sure whether it was legal or not. However I suspect that as long as you’re an experienced surfer it is ok! There is even an annual river surfing competition on the Eisbach river wave. We had fun watching the surfing enthusiasts trying to balance on the waves and the swimmers whizzing past us down the river! Waterfalls on the Eisbach River – the swimmers swept past on the far bank! Our little stroll has covered only a fraction of this magnificent park! If you ever find yourself yourself in Munich, I’d highly recommend spending a few hours or even a brief sojourn in the beautiful Englischer Garten. It’s a lovely spot in which to relax and recharge your batteries, a wonderful facility for Munich residents and visitors alike. Tschuss till next time! For more wonderful walks around the world head over to Restless Jo’s Monday Walk! It looks beautiful, especially the river. If I ever make it to Munich I will definitely have to take a stroll through there. Munich is a city that I would really like to visit! I think you would love Munich Andrew – there is so much history to the city and it has a relaxed feel for a state capital. Even though we were sick initially (nothing to do with Munich!) we had packed a lot in by the end of our trip. I am still sorting through all the photos! Beautiful Rosemary, like you say unbelievable that you are in the centre of a big city with all this green and wide open space. 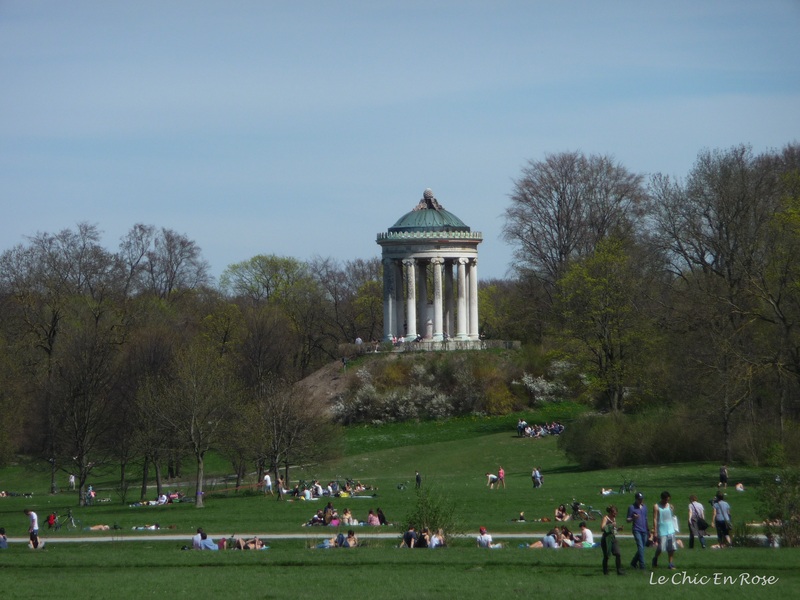 I love the Englischer Garten and remember that beer garden by the Chinese Tower. Swimming down that stretch of river looks more than a bit scarey to me – good to watch others do it though!! Shame you weren’t feeling the best but a good excuse for some delicious ice-cream. My son is going to learn German next year at school – could be a good excuse for a trip – educational purposes!! Wonderful to see from your last two blog posts that you managed to enjoy a great deal of beauty in spite of your flu. I am in a mad rush preparing for my own travel but wanted to say how much I enjoyed your slow travel in places that you might have bi-passed or rushed through had you been feeling better. If you didn’t mention it, I would have guessed this place was a quaint little town tucked somewhere far away in the countryside. Looks so peaceful there, and I’m certain the sun and greenery did you good and made you feel better 🙂 Hope the surfers put on a bit of a spontaneous show for you! That opening shot is fabulous, Rosemay! Hope you’re full of bounce again now 🙂 and thanks a lot for thinking of me. Thanks Jo isn’t it idyllic?! Just what we needed at the time – yes we’ve bounced back and fighting fit again! It was rather an unpleasant flu and just unfortunate that it struck us down whilst travelling especially as we are normally so healthy. German pharmacies are wonderful though so it was as good a place as any to be sick in if that’s any consolation! Am hoping to join along for some more walks soon I have a few posts I want to do that would fit the bill. Am in the midst of a Munich and Bavarian series at present as you can see! Ooh the English Garden! I remember visiting it over a year ago..had a lovely time!